A lot of folks have come to me hoping to learn how to make a guided meditation with music. Surprisingly, it’s not all that hard to do! I’m going to walk you through an easy way to do this (and have it sound good) on a limited budget. Ready? Let’s go! There are a few things you will need before you start the process. You may already have these things or maybe you’ll need to get them. Hopefully you have access to a computer because this tutorial requires you to download some free software in order to make your guided meditation. Most computers will work fine, but you probably won’t be able to complete the process if you have a small netbook-like computer such as a Chromebook. Macs and Windows PCs will work fine! Don’t worry if you haven’t purchased a microphone, because a lot of computers have a decent microphone built in! If you have a Macbook, for example, you probably already have a microphone ready to go. Of course, you will have better sound quality if you purchase a nicer microphone, but that isn’t necessary to make a guided meditation. Perhaps you’ll want to start by using the built-in microphone and decide to purchase a fancier microphone down the line! If you do want to get a nicer microphone, I would suggest a good USB mic such as a Yeti Microphone from Blue. These are technically optional, but you will want to make sure your microphone doesn’t pick up any sound from your computer. 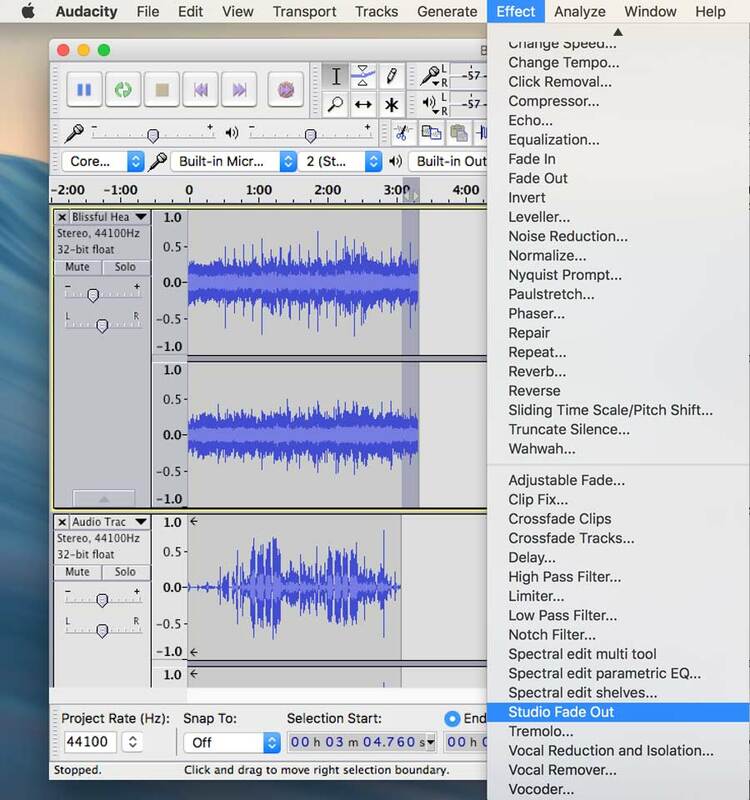 So, if you DON’T have headphones, you will definitely want to mute your computer’s speakers while you are recording your voice. 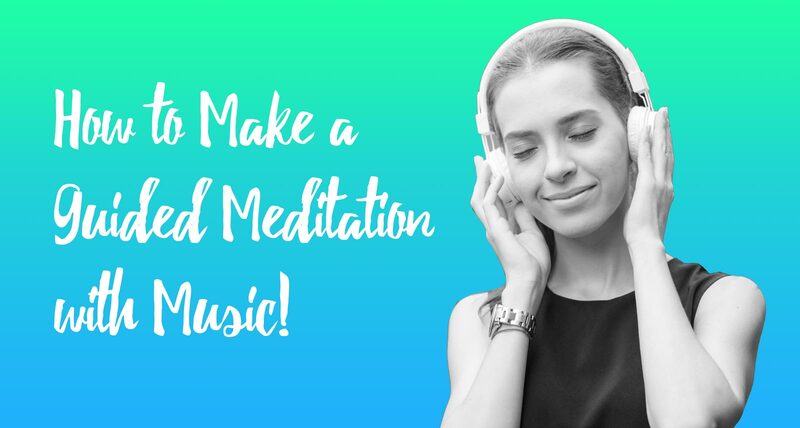 Follow the steps below and you’ll be able to easily make guided meditations! There are many ways to do it, but I find this method to be approachable and simple for beginners who may not have a large budget. Maybe you have already done this or maybe you are planning on improvising your meditation. Either option is fine, but make sure you will be ready to hit that record button soon! If I were you, I would suggest writing down what you will be saying, or at least prepare an outline with bullet points of what the meditation will cover. You will need an audio editing program to create your guided meditation. There are many programs you can use, but I suggest using a free program that works for both Mac and Windows computers. It is called Audacity. 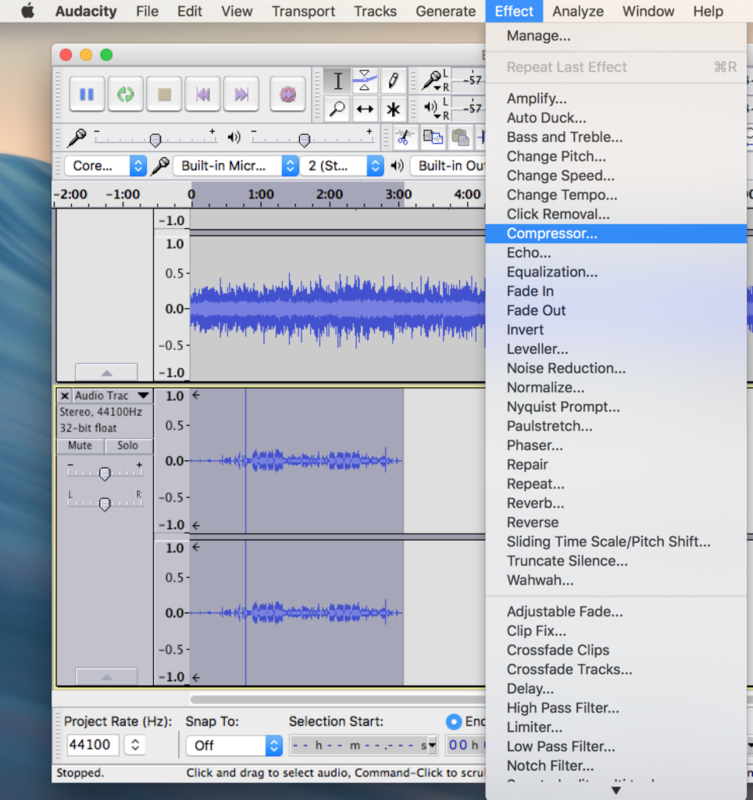 If you have a Mac, you may also want to try using GarageBand, but this tutorial will be using Audacity. I always prefer guided meditations that have good music in the background. However, it’s important to understand that you can’t use just any music in your guided meditation, especially if you plan on selling it. Royalty-free music is music that you can purchase which allows you to use the music in your project without needing to pay royalties. There may be other music options, but I find that royalty-free music is the best bet for creators! Also keep in mind that royalty-free music can have different guidelines for use. You’ll want to make sure to pick music that works for you! For example, some royalty-free music will only allow for a certain number of uses or will only allow use in personal projects. You’ll also want to pick music that is about the same length as your script is, or longer! This may be a good time to mention that I offer dozens of royalty-free meditation music tracks on this site! They all allow for unlimited, commercial use. Therefore, you pay to use them once and you can make as much money as you want with your guided meditations. My music has been listened to over 4 million times, across multiple platforms. I would love to have you use it in your project! Open your newly downloaded and installed Audacity. Then select File > Open and locate the royalty-free music you have saved on your computer. Select the music file you want to import and click “Open”. 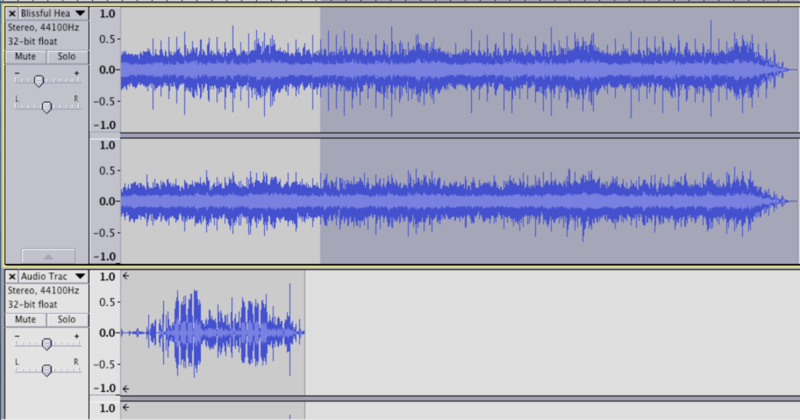 If you keep the music at full-volume, you most likely will have a hard time hearing and editing your voice track. 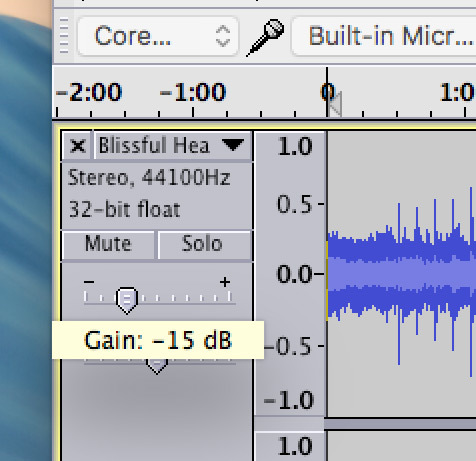 You can adjust the music and voice levels later, but for now you should decrease it to -15 db for now. 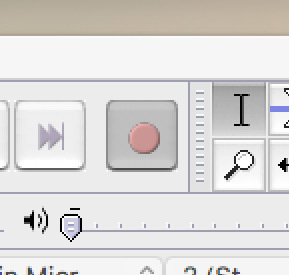 To do this, click and drag the slider to the left of the music track labeled with a “+” and “-“. You should drag it down to about -15 db. Note: I am adding the music first because you’ll want to make sure your voice recording is shorter than the music and it can also be helpful to hear the music in your headphones while you are performing your guided meditation. Get your script out and your microphone ready. Remember, if you have a built-in microphone, you may not need to do anything. If you have a USB microphone, you will need to plug it in and possibly download drivers (if applicable). This is not a tutorial on how to use a microphone, so hopefully you have all that figured out! Important: Be sure to record in a quiet room, free of distractions. You should also wear headphones or turn the volume on your computer all the way down to make sure you don’t record anything coming out of your speakers (such as the music)! 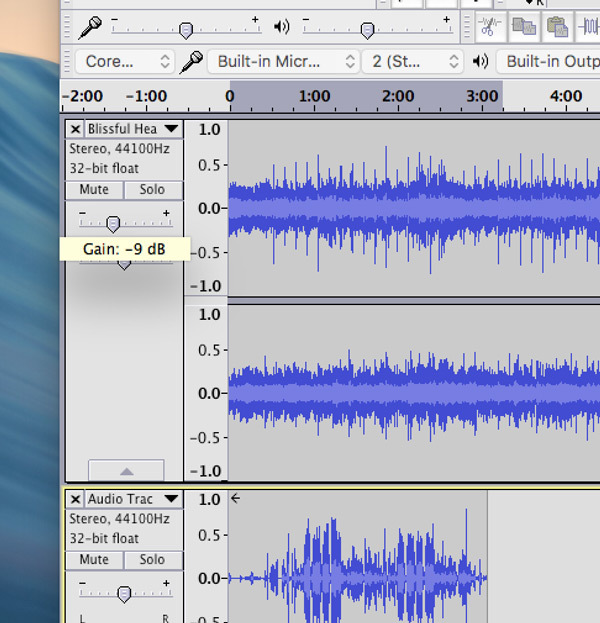 To record, you will simply click the red record button in Audacity and perform your meditation to the best of your ability. Remember to speak slowly and with diction, emulating guided meditations that you have enjoyed in the past. This is your opportunity to add your unique spin, so do your best and have fun with it! Note: Make sure you are starting your recording at the beginning! To do this, you may have to hit the double arrow button to move the playhead to the start of the track. Click the yellow, square “stop” button when you have finished recording! It’s okay if you make a mistake or want to record this in multiple sections (see below)! If you were able to record the entire guided meditation perfectly on your first try, good job! Most of us, however, will not be able to do this. Maybe you recorded the first part perfectly but then messed up or had to stop because you lost your place. In either case, it’s fine, don’t worry! In order to remove audio that you don’t want, you simply have to highlight it using the selection tool (which is active by default) and hit delete! To begin recording where you left off, use the selection tool again and click on the audio track to the right of where the previous recording ended. This will mark where you would like the new recording to begin. Then, click the red record button again and continue your performance. You can do this process as much as you want. Removing small errors such as a random cough is easy! You simply have to click and drag to select the part of the track where you coughed and then hit delete! Keep in mind that this may not be the best method if you need to remove large sections. It might be better to re-record, especially if you are a beginner. You may also have to zoom in (using the magnifying glass tool) to find the cough in question and only highlight that part before deleting it. You may have already noticed that it’s difficult to hear your voice. Don’t panic. This is very common. In order to fix this, I am going to have you complete a few steps. You may have to do this process for each voice track if you have multiple voice tracks within your project. You will probably have multiple voice tracks if you had to record in sections. New recordings automatically start in a new track! 4) I like to set it to -2 db for meditations. Remember that you may need to do this for every voice track if you have your voice recording separated into different tracks! Again, this may be the case if you recorded it in sections. You must now go back to changing the volume of the music track to make it sound balanced when paired with your newly edited voice. You can use the gain slider to the left of the music track to do this. 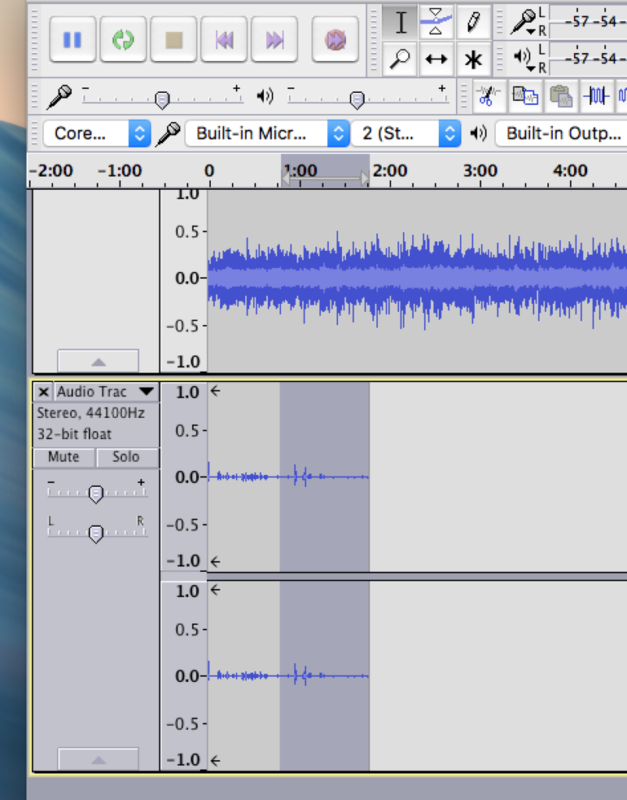 Click the play button in Audacity to listen to your guided meditation and raise/lower the volume of the music so that it plays softly in the background. You want to be able to hear the music, but you definitely don’t want it to be too overpowering! You may have noticed that your music track is longer than your voice track. We’ll need to fade that out so it ends naturally without a long period of music following the guided portion. If the music is too short, you will likely need to pick something longer and use the shorter music for a shorter guided meditation. 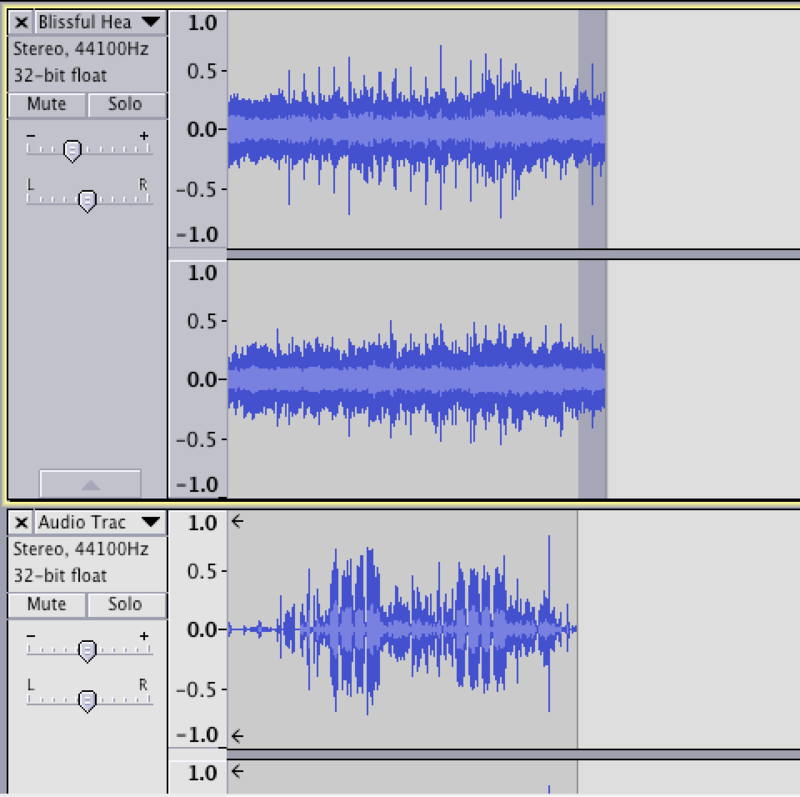 If you’re skilled in audio editing, you could edit the music to repeat, but that is definitely more advanced! Now you should have a well-balanced guided meditation! You’ll want to save this file just in case you need to edit it later. In fact, you should probably save the project throughout the whole process, just to be safe. To save, click File > Save Project, give the project a name, and save it somewhere on your computer. This is the final step! Congratulations. You now get to export your completed guided meditation as a file you can use. You can sell this on your website, make a YouTube video using it, or put it on a CD. It’s up to you! 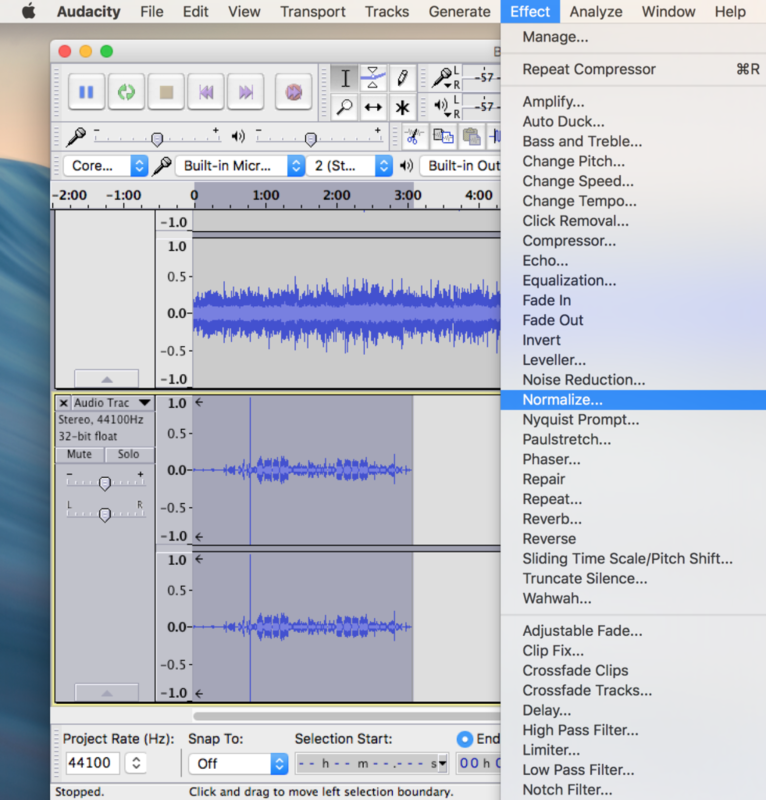 To export, click File > Export Audio and use the “Format” dropdown to select an audio type. I would recommend an uncompressed audio type such as “WAV – 32 bit”. I hope you enjoyed this tutorial and that you learned how to make a guided meditation! If you have any questions or comments, feel free to use the contact area below or get in touch. And remember, I have lots of relaxing royalty-free music you can use for your guided meditations! Thank you so much for your article Chris! I appreciate it. I have written guided meditations for a long time and lead groups with them but never thought I could record them or knew how. With your article I think I will be able to record them now. I just ordered a microphone and headphones and downloaded the Audacity program. I am looking forward to giving it a try when the equipment arrives. I also unknowingly have been listening to your music meditations on the app Insight Timer recently. Thank you for your help!